The cube! « Phloggings will continue until morale improves…. I walked more blocks than were necessary before jumping on the subway for (only) two stops to the hotel. I did find my Bear-face nerding it up as you saw in my last post. Even though lunch was nearly an hour before, we decided to slip me into the dining room to feed off the conference leftovers for free. I decided against the veal (cute animal reasons?) & went for a delicious cheese filled ravioli. Bread slathered with fancy cut butter & fruity jam. Do not forget a bottle of water. Non-sparkling, if you please. You MUST be specific, or you will get fizzy water every. single. time. Kissing Bear Face goodbye & once again checking my paper map I opted for catching the subway, destination: The Cube. 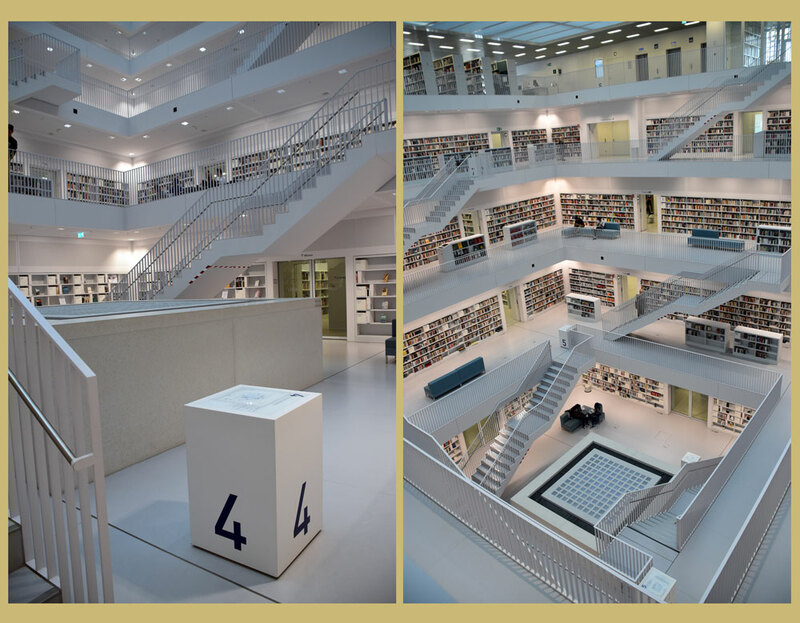 I had just enough daylight for one more destination today & it was going to be the Stuttgart City Library. 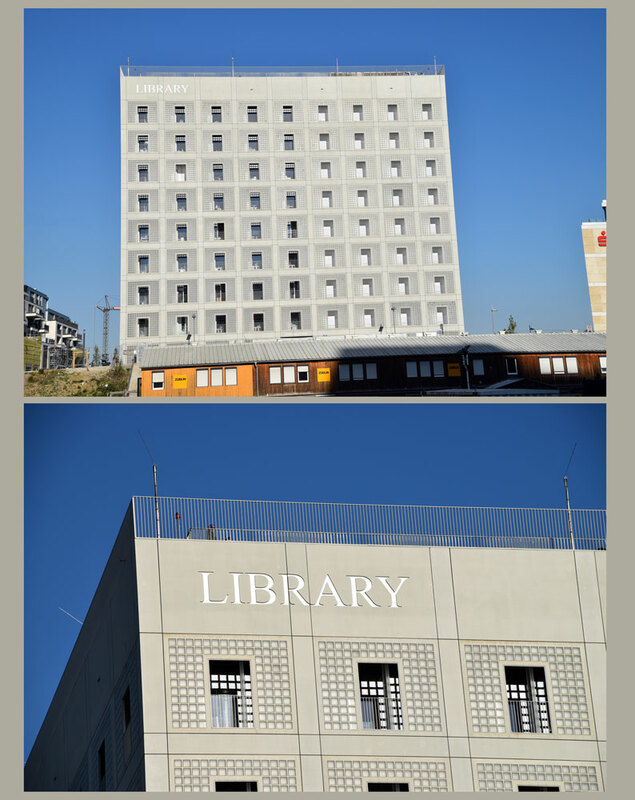 The subway pops out of ground just long enough for this perfect view (top picture) of the Library. Each side of the cube has “Library” written in a different language & the subway side happens to be English. The other sides are German, Arabic & Korean. If you look closely you can see people up at the very top. Sadly I didn’t see the people when I took this nor did I realize you could hang out up there or I would have spent most of my time enjoying the beautiful views of the city. Surprise! No books. This is the very center of the Library & it has this bubbling fountain flush with the floor & all these blank rectangular windows gazing down at it. I’ve seen videos of flash mob ballroom dancers in this room, ballerina photo shoots & people playing music, but when I was there most people were just walking through like I was. Ok the “no books” thing was a joke. 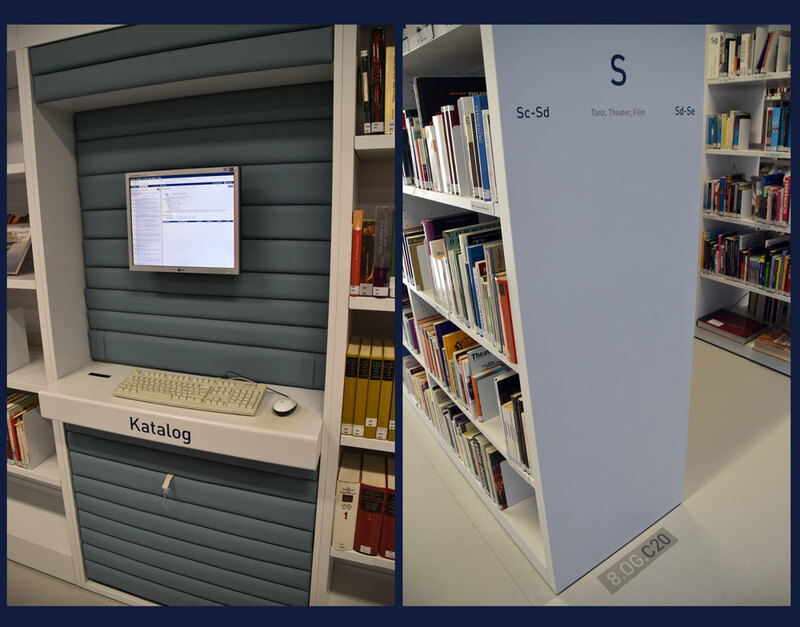 These are the stacks & the “Katalog” computer access. If you pull on that white tab under the keyboard it reveals absolutely nothing interesting. Yes I pulled it open. 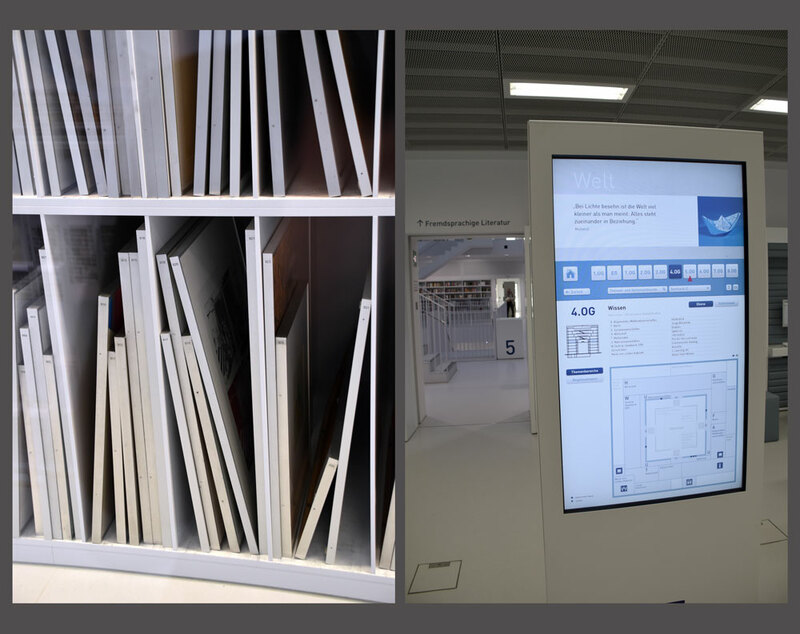 The shelves everywhere are all white with the reference information on the actual shelf & on the floor, which I thought was great until you have to rearrange the stacks for some reason. They do that quite a lot at the Beaverton City Library, people returning a bunch of one kind of item, or checking out a ton of another, eliminating certain books, purchasing different kinds, lots of movement. I found the old wooden card catalog! No cards inside. This is the book return roller coaster… Seriously those blue carts move all over, upside down on those tracks returning items to their correct floor. Counting the basement & ground floor (what we normally call the first floor) there are 10 floors of blue book cart roller coaster. You can watch it in action here & here. SO fancy. Here is where you feel like you’ve stepped into the M.C. Escher lithograph “Relativity.” (The one with all the crazy staircases.) 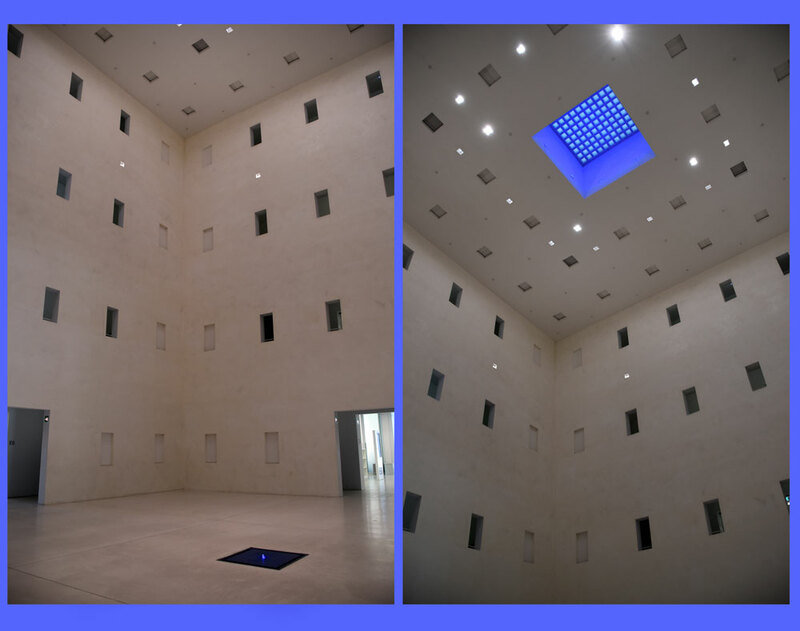 In the right hand picture, all those glass squares on the bottom floor are the ceiling to that space with no books. Each floor has it’s floor number on a cube & a handy map on top. The Library was exactly this empty, I did not photoshop people out as I have sometimes done. It was probably that it was almost closing time. 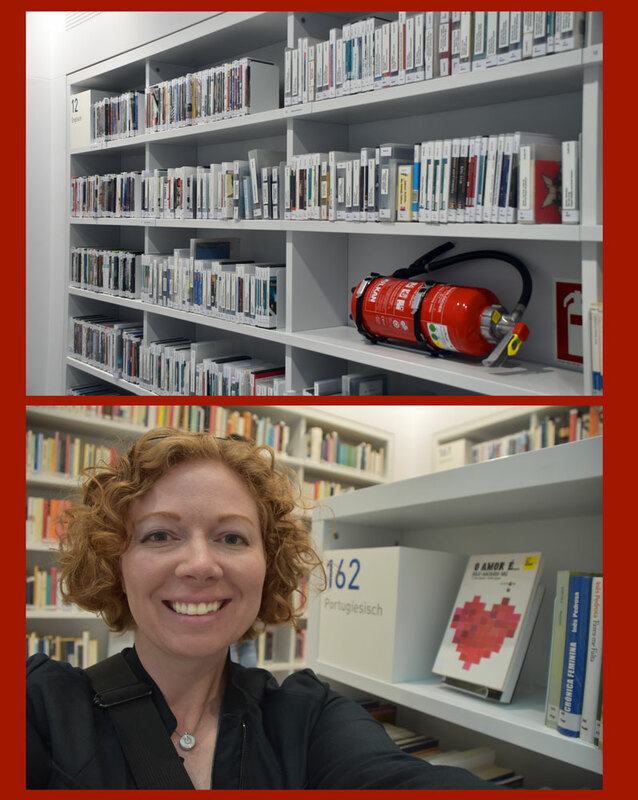 It is hilarious to me that they have the fire extinguisher on the “Englisch” shelf. The “Portugiesisch” shelf nearby had a book all about love of course. <3 This is where I started loving this Library. They have these originals & prints of more than 1,100 artists you can pull right off the shelf! I love that. 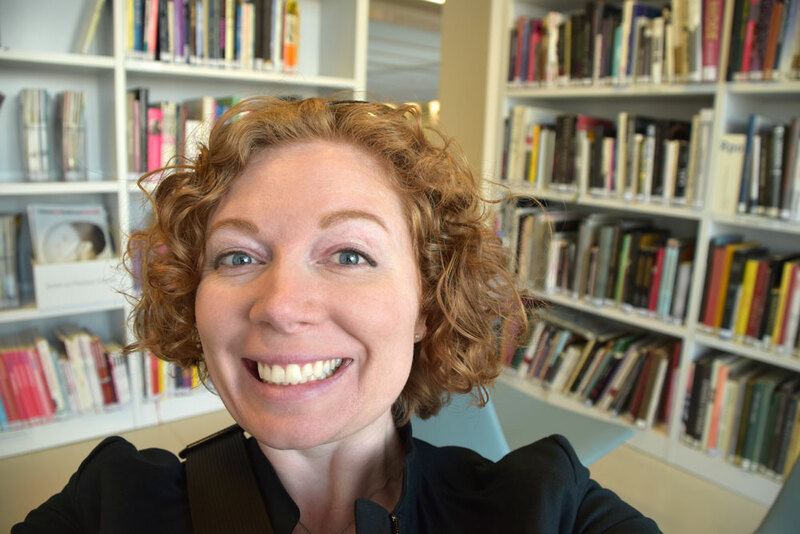 They also have an Online Animation Library (which is exactly as magical as it sounds), a cafe, software for composing music + a piano keyboard, a gallery with screens & headphones for various visual art displays (I watched “The Noise Between the Frames”), & yes you can get married in the Library. 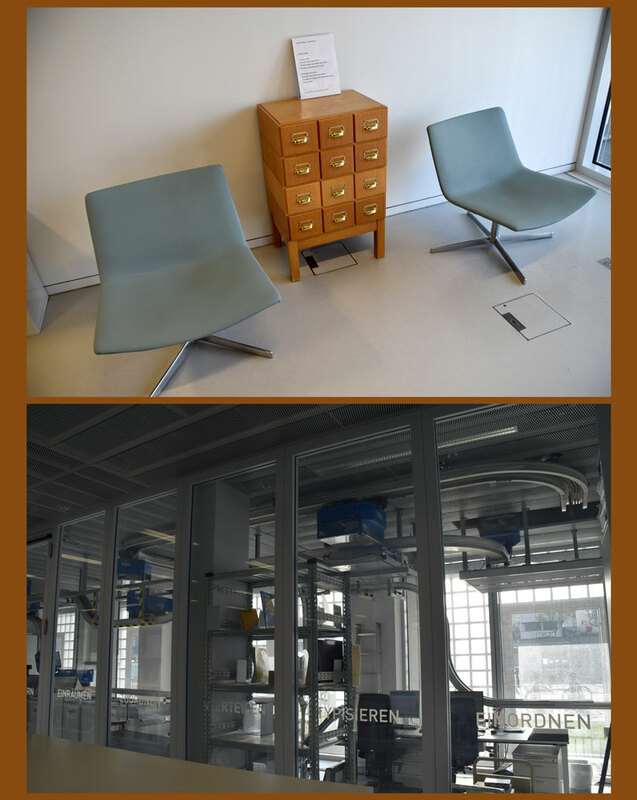 Part of the Stuttgart City Library is open after hours accessible by Library card with select titles & films available for “insomniacs” as they put it. 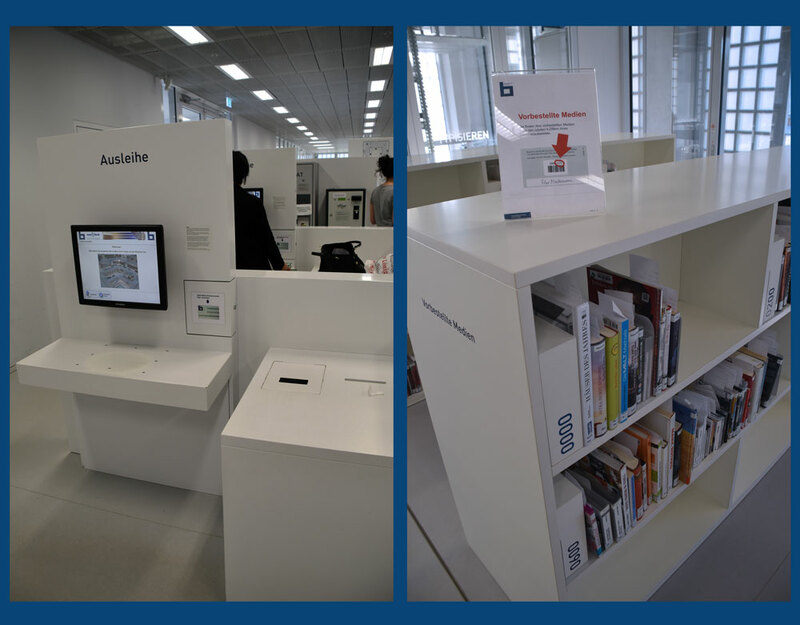 They have self-check & behind the two self-check machines in the picture above is the payment machine (I got to use it, more on that in a moment) that way Library employees don’t actually handle any money. So nice! 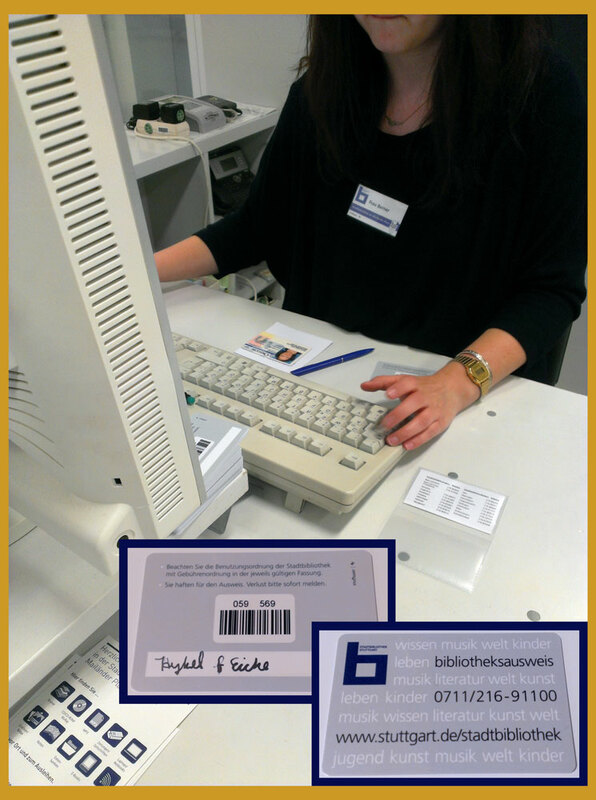 They shelve holds by Library card number, not by name. I don’t know if that is more or less confusing. Speaking of holds, now that you have my library card number you can pick them up for me. I have a ton of holds there! Yes I got a Stuttgart City Library card as a souvenir. Frau Berner was super helpful & nice when I told her I would like a Library card. Best 4 Euro I ever spent & I got to use the payment machine. 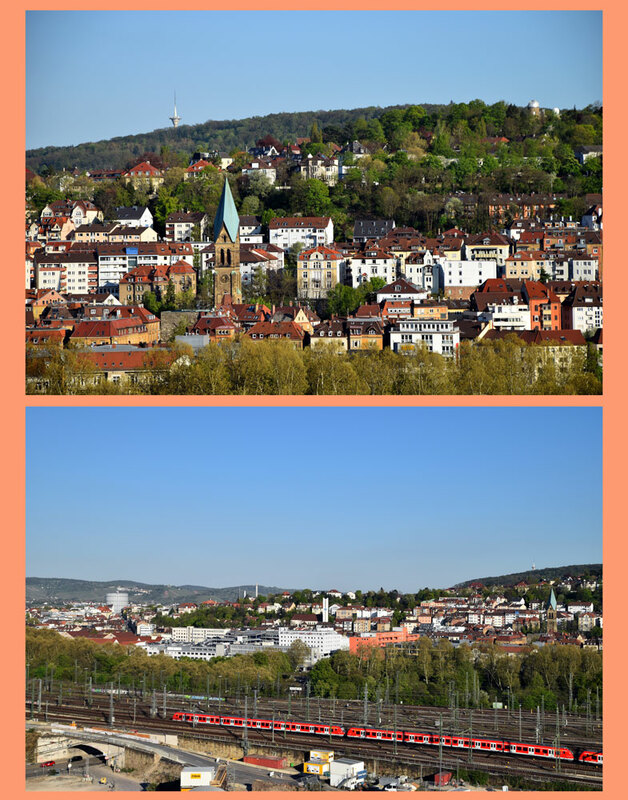 Now the eye candy you’ve all been waiting for, the views of the city from the Stuttgart City Library balconies. There are sliding glass doors on each floor that lead out to these beautiful scenes. 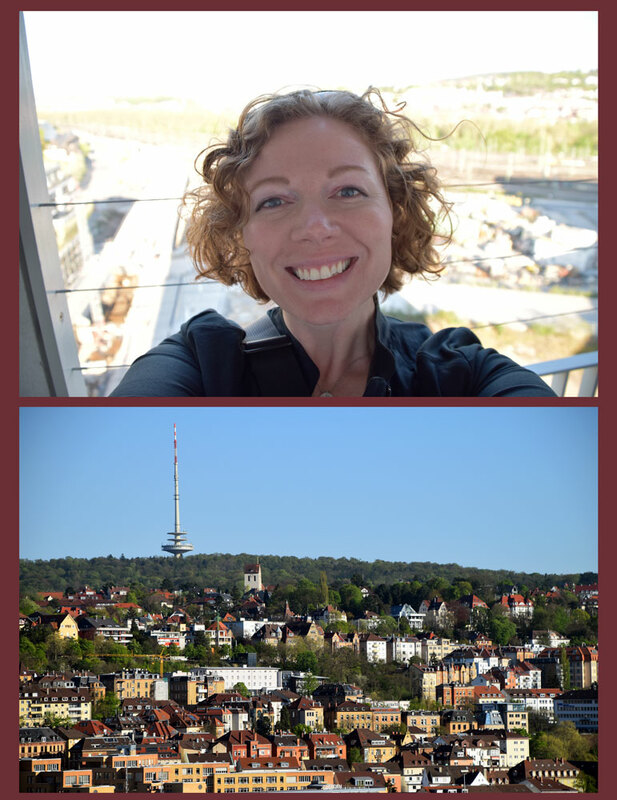 The tower just peaking over the hill in the top picture is the police & fire transmission tower. The bottom picture above has the giant circular gas storage building, which is right by the Pig Museum from the other day. It also shows the train tracks that will take us to Frankfurt on Friday. The top picture above is eye candy for Aaron. What you can’t see is exactly how windy it was & how many selfies I had to take before my hair was finally out of my eyes. The weather was perfect even with that & I stood out there soaking it all in for long, long minutes. It’s a telecommunications tower in the bottom picture above for those who are as curious as I am. Next up: Dinner with International Nerds. I loved The Cube! And the views are amazing. The first one you have posted looks like a picture-perfect postcard. You must have taken excellent notes on your adventures or else you have the best memory on the planet. Keep the posts coming! This was really enjoyable! Do you think the Beaverton library would be interested in any of those technologies? I also liked the links to the performances. I wonder if anyone has ever done a light show in there. Not much room for an audience though.